From singing funky, jazz-inspired tunes in the loud city of Las Vegas to lulling his three young children to sleep after a long night, Frank Sinatra has done it all. A loving father, Sinatra dedicated over 50 years of his life to music. Francis Albert “Frank” Sinatra was born in Hoboken, New Jersey, on December 12, 1915. The only child of two Sicilian immigrants, he first got into music as a teen after watching Bing Crosby perform live. During this time, Sinatra joined his high school's glee club. Soon, he started singing at local nightclubs. Later came radio exposure; on this platform, Sinatra caught the attention of bandleader Harry James. Sinatra recorded his first album, “All or Nothing at All,” in 1939 with the help of Harry James. Sinatra accepted an invitation to join Tommy Dorsey’s band. With this band, he recorded many chart-topping hits. A couple years later, Sinatra decided to enter the industry on his own as a solo artist. Between 1943 and 1946, his solo career flourished. Sinatra’s deep voice earned him nicknames like “The Voice” and “The Sultan of Swoon.” Also, during this time, he made several film appearances, one of which for, The House I Live In, won him an Academy Award. However, Sinatra’s career then took a dip. For a short time in the 1950's, he had a difficult time getting any record or film contracts. Yet, he made an astonishing come back in 1953 when he won an Oscar for his role as an Italian-American soldier named “Maggio” in the classic film From Here to Eternity. In the same year, Sinatra signed a recording contract with Capitol Records. Through this label, he found a more mature, jazz-inspired sound. In the years to come, Sinatra acted in multiple films and produced more music, some of which made the charts. He eventually decided to leave Capitol Records due to loss of sales and went on to create his own record label, Reprise, which was later bought by Warner Bros. This company also helped Sinatra establish his film production company, Artanis. During Sinatra's career, he married four times. From 1939 to the late 1940's, he was married to Nancy Barbato, with whom he had three children: Nancy, born in 1940, Frank Sinatra Jr., born in 1944; and Tina, born in 1948. He married Ava Gardner in 1951 and soon after that union ended, wed Mia Farrow in 1956. Sinatra married for the fourth and final time in 1976 to Barbra Blakely Marx. 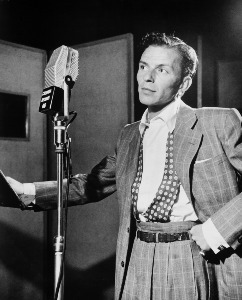 Sinatra died on May 14, 1955, due to a heart attack. He was 82-years-old. For his full and eventful life, he will always be remembered.